JEFFERSON CITY, Mo. - The father of an American student arrested during protests in Egypt says his 19-year-old son has called home and said he's being treated well under the circumstances. Derrik Sweeney, of Jefferson City, Mo., was among three American students arrested this week in Cairo. Kevin Sweeney says his son called about 6:30 a.m. on Wednesday from the phone of a U.S. Embassy official before additional questioning and spoke "very briefly" with his mother Joy Sweeney. The teen said he hasn't been hurt. An Egyptian official has said Sweeney and two other students - Luke Gates, a 21-year-old Indiana University student, and Gregory Porter, a 19-year-old Drexel University student - were arrested on the roof of a university building where they were throwing firebombs at security forces fighting with protesters near Tahrir Square. Kevin Sweeney says his son said he was watching the demonstrations but denies throwing anything. 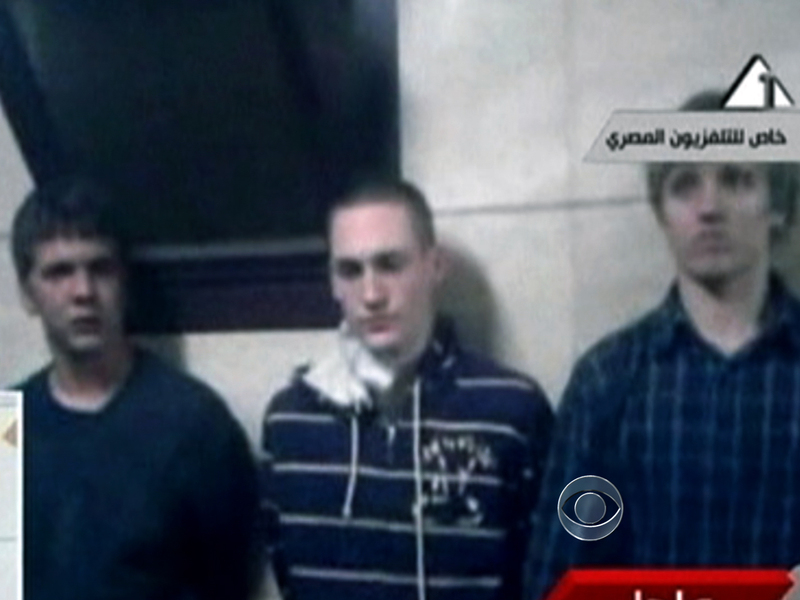 Morgan Roth, spokeswoman for the American University in Cairo, said the three were questioned Tuesday by an Egyptian prosecutor with a U.S. Embassy official present. State Department spokesman Mark Toner confirmed Wednesday afternoon that the U.S. had been given access to the students, though he offered no specifics from the meeting. He did say he was under the impression that no formal charges had been filed against them as of yet. He said the State Department was monitoring the situation closely. A university official tells CBS News correspondent Elizabeth Palmer the three young men would face another round of interrogation Wednesday from the State Security Public Prosecutor. Roth said it wasn't unusual for American students to get "caught up" in Egyptian politics, she said. Sweeney's mother, Joy Sweeney, described him as a principled person who stands up for his beliefs. He attended previous protests but stopped after a demonstration where dozens were killed, she said. He had assured his family the violence wasn't near him and he was safe. Still, Joy Sweeney said she wasn't surprised he went. "He got caught up in the whole college-change-the-world mentality, and he believes in democracy strongly," she said. But she also said her son was the family peacemaker when siblings fought and she couldn't see him acting violently. "I don't believe that he would intentionally throw a bomb at anyone," she said. "I don't believe that." Joy Sweeney said others attending previous demonstrations had praised her son's Arabic and appreciated that a "blond-hair, blue-eyed kid" was supporting their calls for democracy. The wave of protests and violence across Egypt that began Saturday has left 38 dead, according to a rights group, and thrown the country's politics into chaos less than a week before landmark parliamentary elections were to begin. Assil Dayri, 17, of Geneva, Switzerland, an American University student who is friends with Derrik Sweeney and Luke Gates, said they left the school Monday evening to see what was going on Tahrir Square. By 3:30 a.m., he got a call that they were being taken away by people they didn't know and that they didn't know where they were going, he said. Then the phone cut off. He said he's confident his friends were not throwing firebombs as Egyptian officials have said but neither know Arabic well enough to communicate with Egyptian police. "I think it's a big misunderstanding," Dayri said by telephone. He said he's heard claims authorities found a backpack containing explosives that belonged to Sweeney, but it wasn't his. "He left without a backpack," Dayri said.